Boss Jamie Vermiglio is looking to make the Magpies more productive in front of goal next season – while retaining their usual resoluteness at the back. The new Chorley manager – who prepares his team to take on Tranmere at Victory Park this evening – has studied the team’s record last season. Although they boasted the second best defensive record in the National League North, they were also among the division’s lowest scorers. In fact, only four other teams scored less goals than Chorley last season and Vermiglio is keen to see his men be more of a threat in front of goal. He has been pleased with the way his side have performed in pre-season – and the number of chances they have been creating. However, he would like to see his men start converting more of these opportunities. On Saturday against a strong Morecambe outfit, the Magpies did well for an hour before conceding three goals late on which gave the final scoreline of 5-0 a slightly flattering look. “I was very happy with the performance against Morecambe – for 60 minutes we more than held our own,” said Vermiglio. “We are trying to score more goals and we have created quite a few chances in pre-season, but we are not managing to get the ball in the back of the net. “The style of play is going to be similar to last season, but just looking to make a few tweaks to help us score more goals. “To be fair apart from the Trafford and Euxton games, we have come up against some stiff opposition in pre-season. Meanwhile, CVermiglio is hoping to get more minutes in the legs of his players when they welcome Tranmere Rovers to Victory Park this evening. It should be another tough pre-season test for the Magpies. 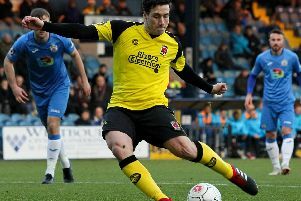 The match against the Shrimps was due to take place at Chorley, but the game had to be moved due to the pitch not being deemed fit enough after the recent hot weather. Vermiglio revealed that the club is taking a bit of a risk in staging the game tonight as the pitch is still not quite right. “The pitch is not 100% right. It’s probably in the best condition it has ever been, it just probably needs another week’s recovery. But playing Tranmere will be a good test for us. “I have spoken to their manager Micky Mellon and he has told me they are bringing a strong side. “Pre-season has so far been great. The lads are in good spirits. We have always been renowned for having a good team spirit. The new lads have come in and settled in nicely. “Chris Almond and Wes Fletcher have already shown what they are capable of even though they have only had 45 and 60 minutes game time in pre-season. The Magpies trailed the Shrimps at half-time to a Rhys Oates and they fell further behind just before the hour-mark to a Steve Old header. A Dale Whitham own goal and strikes from Kevin Ellison and Jason Oswell completed the scoring. “The scoreline against Morecambe was slightly flattering to them,” said Vermiglio. “I spoke to their manager Jim Bentley after the game and he was very complimentary about the way we played. Meanwhile, Vermiglio revealed that he will miss the opening game of the season at home to York City as he is on holiday. His assistant Jonthan Smith and first-team coach Andy Preece will take charge of the team. The club has also revealed that Josh Gregory has left the club and Chris Doyle has signed for Marine, who Chorley travel to this weekend.